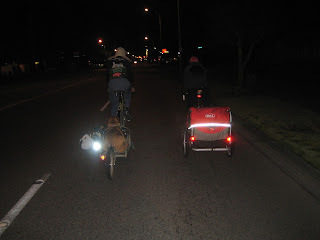 Our first night ride event! The Tacoma Wheelmens Bicycle Club have invited us to join them as volunteers for the MetroParks Tacoma Black Cat Fun Run. We will be sweeping (riding behind) the 2.5 mile kids run course in Point Defiance Park, making sure no one is left behind in the spooky darkness. -We will be riding on a closed paved course within the park and you may want to bring a front headlight to better see the road. -If you are wearing a costume, make sure that no part of it drags near your chain or wheels. As always, dress for the weather. -Helmets are required! Consider decorating it to match your costume. -If you are riding to this event on open streets, you are required by law to have both front and rear lights. We recognize that this ride won't be a good fit for our youngest or less experienced riders, but this is a great opportunity to get older and more experienced riders a taste of riding at night.